Heat oven to 350°F. 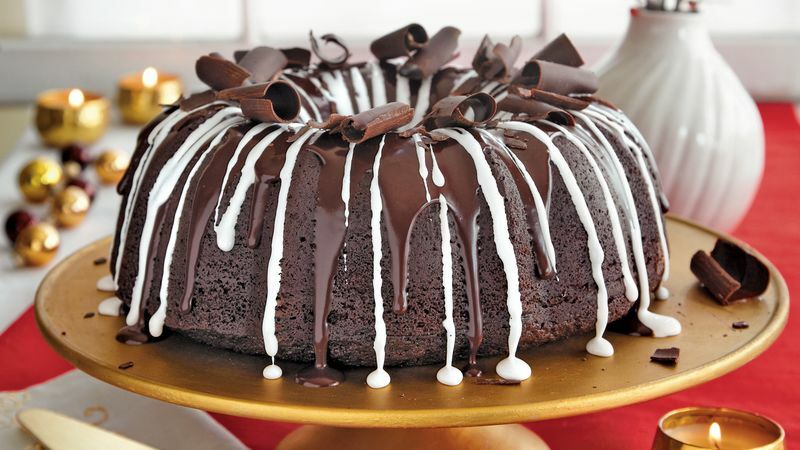 Lightly grease 12-cup fluted tube cake pan with shortening; sprinkle with unsweetened cocoa. In 3-quart heavy saucepan, stir water, 3/4 cup butter, the oil and 4 oz bittersweet chocolate. Cook over low heat 8 to 10 minutes, stirring constantly, until chocolate is melted and mixture is smooth. Remove from heat. Stir in sugar until blended. Cool 10 minutes. In medium bowl, mix flour, ground chocolate and cocoa, baking soda and salt. Add eggs, one at a time, to cooled chocolate mixture, beating with whisk just until blended after each addition. Add flour mixture alternately with buttermilk, stirring just until blended. Stir in vanilla. Pour batter into pan. Bake 45 to 50 minutes or until toothpick inserted in center comes out clean. Cool 15 minutes; remove from pan to cooling rack. Cool completely, about 2 hours. In medium microwavable bowl, microwave ganache ingredients on High 45 to 50 seconds, stirring after 30 seconds, until melted and smooth. Cool 10 minutes or until slightly thickened. Place cake on serving plate; drizzle with ganache. Refrigerate 30 minutes or until set. Spoon marshmallow creme into resealable freezer plastic bag; seal bag. Cut off 1/2-inch corner of bag. Squeeze bag to drizzle marshmallow creme over top of cake, allowing some to drip down the side. Garnish with chocolate curls. Make curls by firmly pressing a vegetable peeler against a block or bar of chocolate and pulling it toward you in long, thin strokes.